Here at Nasco Electric Sign Company, we are dedicated to providing our customers top quality signs. With over 20 years experience in the sign business, we have gained the expertise required for such a challenging industry. We have worked with various companies all over the country, from the East Coast to the West Coast. We manufacture everything from small sets of channel letters to giant monument signs and pylons. With an expanding shop floor, we are able to provide our customers with excellent signs and a short turn around time. As a strictly wholesale company, we will not compete with you at the retail level. Our job is to surpass your expectations. Whether it is a channel letter set at one location or 100 locations, we will go above and beyond in order to guarantee our customer’s satisfaction. Trust is important to us and that is why we believe in building a relationship with our customers. Contact us today to start building that relationship that will provide you with the best signs in the business, that only Nasco can provide. Nasco Electric Sign Company is committed to excellence. We employ the best metal fabricators in the industry. Those fabricators use state of the art equipment in our 40,000 sqft warehouse. We can build your next sign project! Nasco Electric Sign Company is a team like no other. 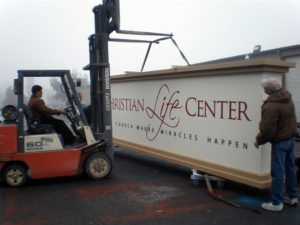 We work together to ensure that your sign project flows through our warehouse and impresses your clients. We employ the best practices in the industry and take pride in our work.